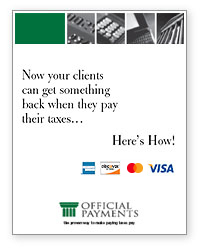 We have created the following informational material for distribution to Tax Professionals and their clients. For your convenience, the material can be downloaded directly from our Web site by clicking on the document you wish to print. You may also request preprinted color samples. 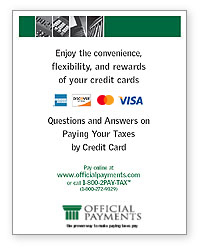 Brochure describing the credit card payment service. Also includes a checklist which provides all pertinent information for taxpayers to complete a payment transaction. Questions and Answers. Prepares Tax Professionals for client questions.